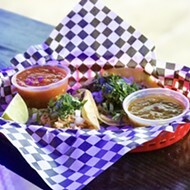 Taco Buddha (7405 Pershing Avenue, University City) offers just what you would expect from its name: tacos. 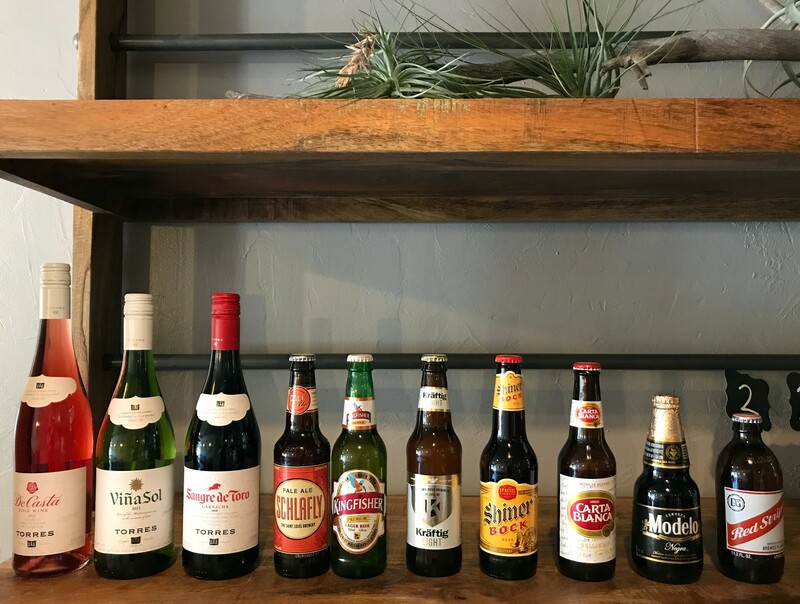 The flavors, however, are delightfully unexpected, representing the owners’ travels through the American southwest, Mexico, the Caribbean, India and Asia, and limited only by their imagination. 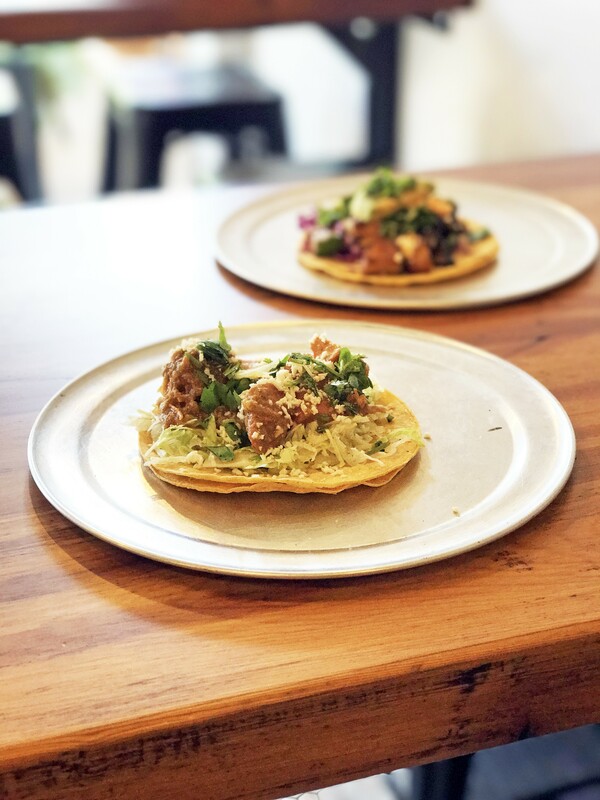 Co-owner Kurt Eller describes the taco as a “humble vessel for flavors from around the world,” referencing the nod to Buddhist philosophy in the restaurant’s name. 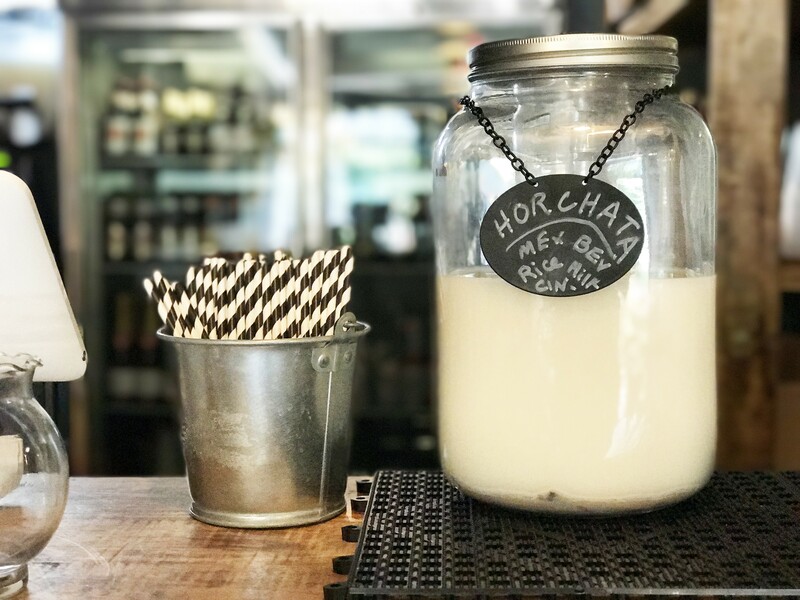 The menu is designed to cater to all tastes, vegetarians and carnivores alike, and offers simple, “humble” food made from scratch with fresh, quality ingredients. 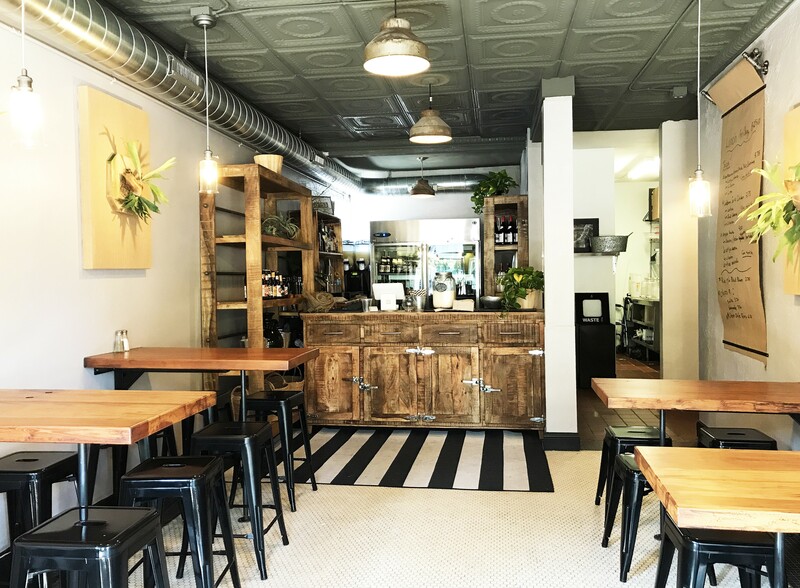 Eller and his partner Erin McCracken have taken over part of the space on the corner of Pershing and Jackson that previously held Perjax and Bici Cafe. (The other half is Cursed Bikes & Coffee, which opened in May.) Eller had worked in the restaurant industry in Austin before moving to St. Louis eleven years ago, as he told the RFT in May. More recently, he operated as a caterer under the Taco Buddha name before sensing opportunity in the storefront, which is located in his neighborhood. 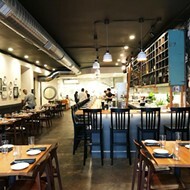 Though its grand opening was August 24, the restaurant is operating on a limited schedule with a smaller menu for a couple of months while staff and inventory ramp up. The day’s offerings are written on the wall-mounted paper wheel. 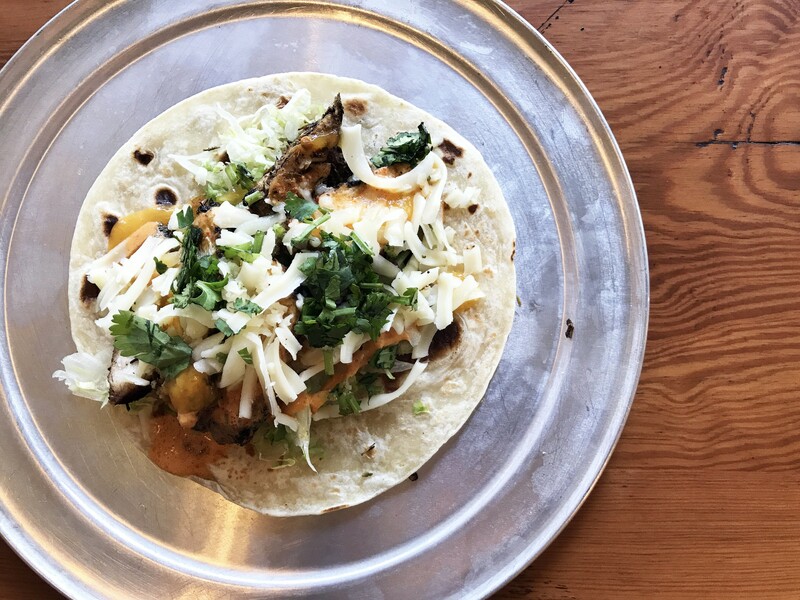 Already a customer favorite, the tandoori-style chicken taco is one of the more unusual items on the menu. 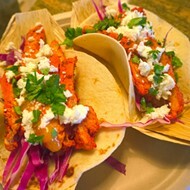 Chicken marinated in a marsala sauce is grilled and served on a flour tortilla with cabbage slaw, cotija cheese, cilantro, mango chutney and New Mexico red chile cream. 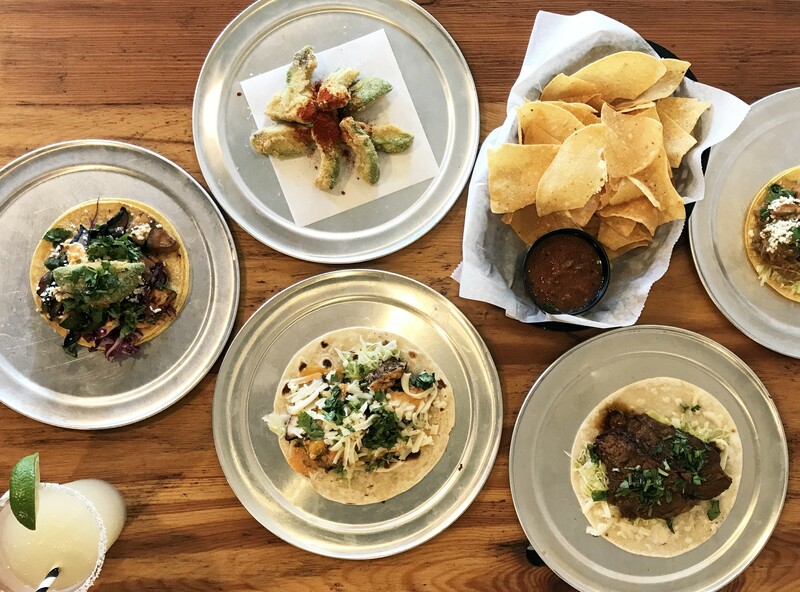 Other unusual tacos on the restaurant's roster include the "Thai Street beef," with beef marinated in a ginger, soy and lime sauce on a flour tortilla; a smoked beef brisket taco; a jerk chicken taco with mango chutney; and a New Mexico Cajun shrimp taco. 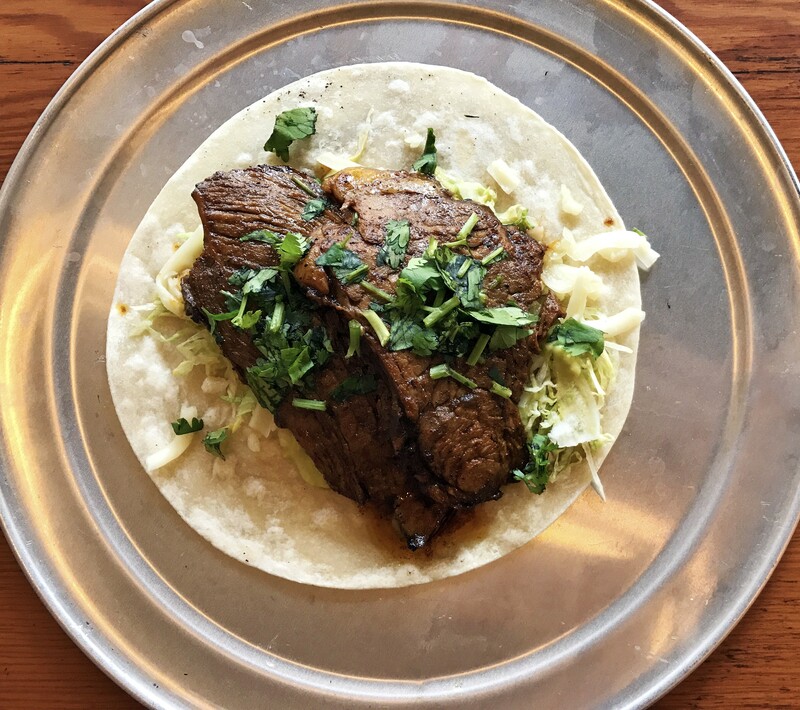 On the more traditional side, one taco offers steak crusted with New Mexico red chiles and served with lettuce, jack cheese, avocado and jalapeno sauce on a flour tortilla. 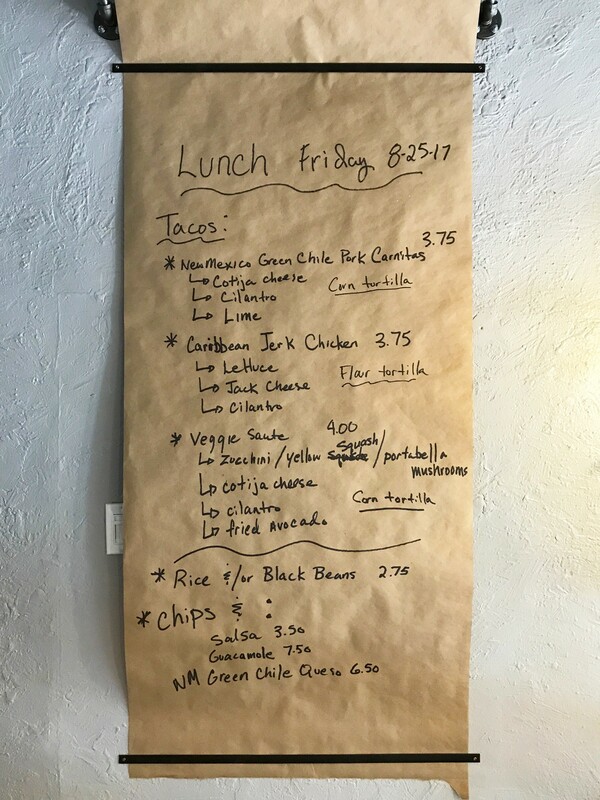 New Mexico green chiles appear on another taco with pork carnitas. A frequent visitor to New Mexico, Eller wants to showcase its chiles, which can be hard to find locally. 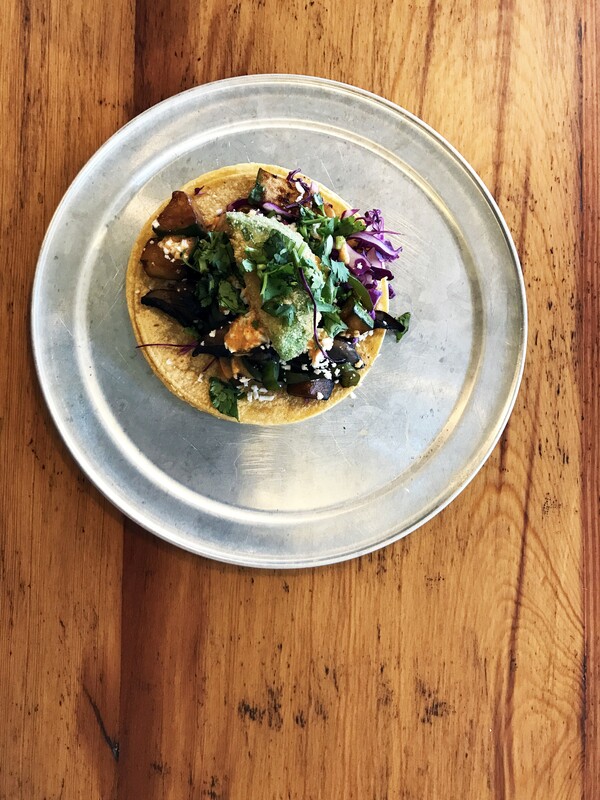 A vegetarian taco is served brimming with portabella mushrooms, squash, onions, peppers, cabbage slaw, cilantro and jalapeno sauce and topped with a fried avocado, all served on a corn tortilla. Breakfast tacos are offered in the morning ready to go or made to order. Appetizers are on the traditional side. Chips come with a roasted red pepper salsa or guacamole. Other offerings include New Mexico green chile queso, ceviche or quesadillas. Get a side of fried avocados or street corn for more Southwestern-influenced nosh. A hefty dessert menu includes all of your indulgent Mexican favorites: flan, tres leches cake, Texas pralines, sopapillas and bananas de leche. 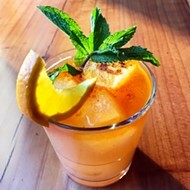 Taco Buddha also offers margaritas, cocktails, beer and wine. Meals inside are served on hefty wooden tables, which Eller made personally with wood salvaged from the Cupples Station renovation. (The lumber was originally harvested before the Civil War.) It's not the only furniture in the restaurant with a story to tell. Eller purchased the mango wood buffet and shelving in India, where he had a stint in the furniture industry. Mango wood is a fast-growing, renewable wood, making it a sustainable option for furniture. 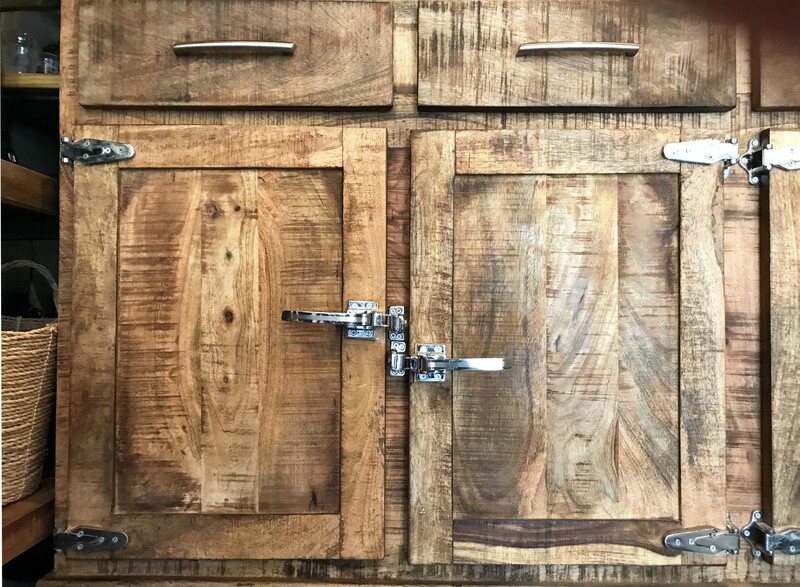 Repurposed wood is also sustainable, as it avoids the need to cut down new trees. 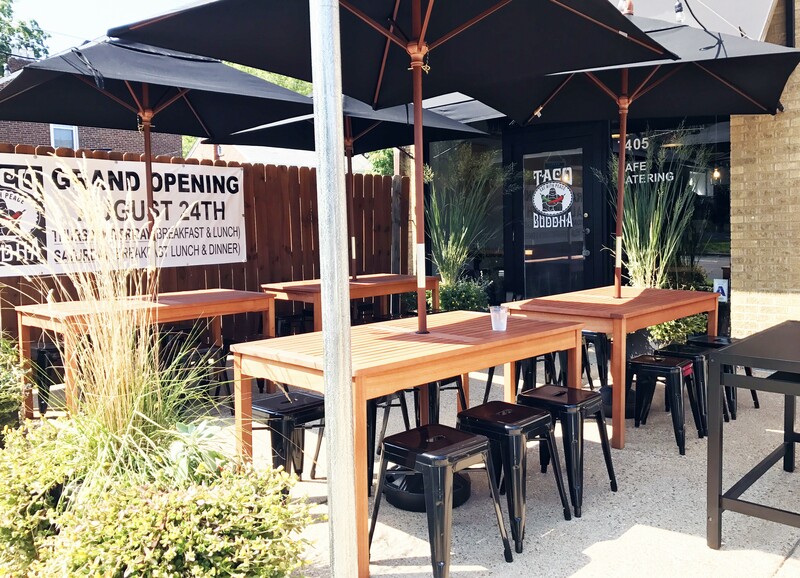 This is just part of the sustainable plan being implemented at Taco Buddha by McCracken, the restaurant's operating partner. 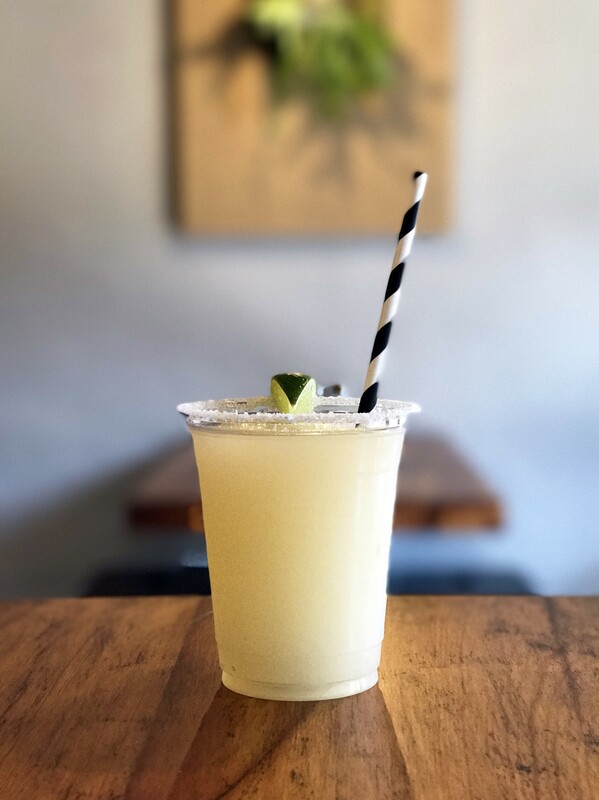 All of the eatery's to-go containers (and the paper straws) are recyclable and the restaurant is in the process of implementing a composting program for food scraps with St. Louis Composting. Breakfast and lunch are available Thursday through Saturday (8 a.m. – 11 a.m. and 11:30 a.m. – 2:30 p.m.). 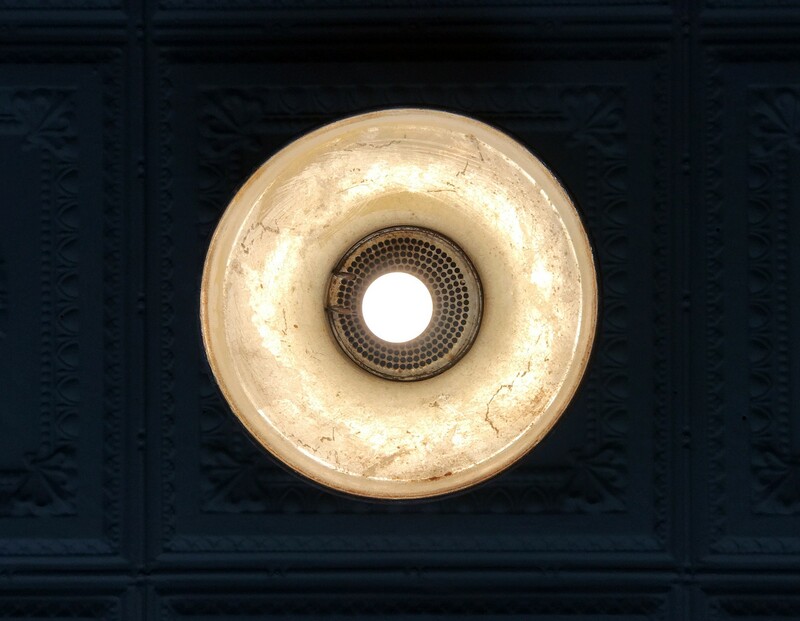 Dinner service is available Thursday through Saturday from 4 p.m. – 9 p.m.
Scroll down for additional photos of the restaurant and menu. Follow Sara Graham on Instagram and Twitter at @engagetaste. E-mail the author at sara@engagetaste.com.